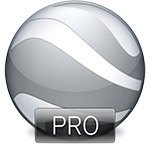 As of a few days ago, Google Earth Pro is now free. Google Earth Pro is a mapping/virtual globe/geographical application and service which used to cost $399 per year, and is obviously the “pro” version of the popular and free Google Earth. Google Earth is a popular (and useful) application for those conducting genealogy research. It can help you in situations where you can’t physically visit an area, say a farm or a house tied to an ancestor, and it can also help you plan genealogy-related trips. Measure distances (feet, miles, kilometers, acres, etc. Some of those features are present in a limited capacity in Google Earth, but you can see the possibilities for genealogists. You can read more about Google Earth Pro (and the limitations) here (Google Earth Pro Features).